To be honest, I was still reeling from the 200 euros I’d just been charged for a taxi from Cannes to get to Les Roches Rouges, the reception area in which this exchange took place, so didn't argue. 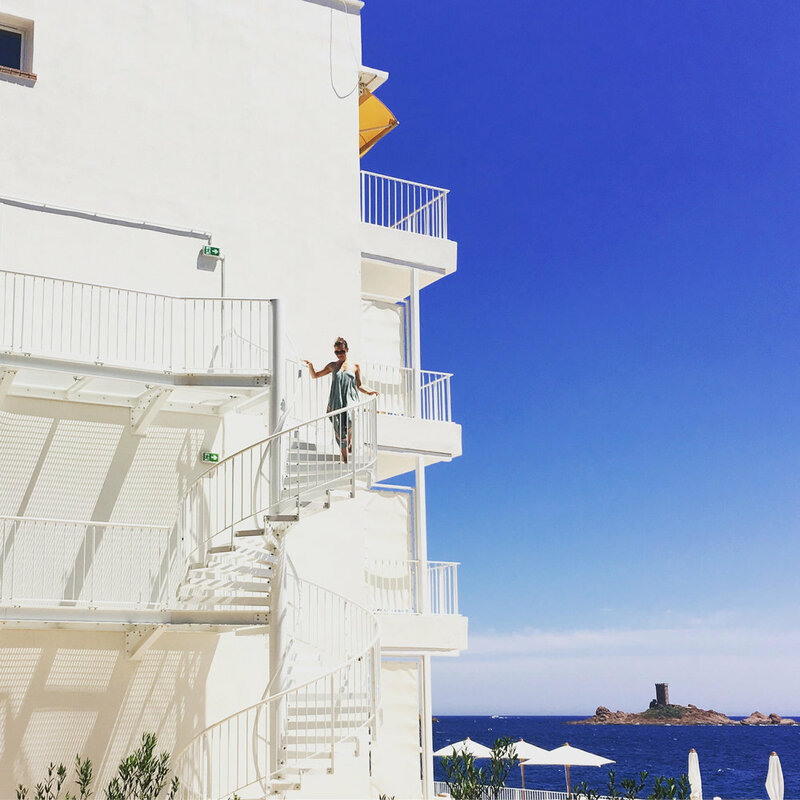 The paint was barely dry when we rocked up at Les Roches Rouges, a new design hotel housed in an old Fifties block on the Cote d’Azur, a mere 200 euros away from Cannes (or about 50 km if you’re sensible and drive yourself). I’m happy to report that all bathroom locks are now working just fine, the rooftop bar and restaurant were still closed as of late June when we visited, although I’m assured they are now open, coffee delivery to your table at breakfast is erratic, to say the least, (three different types came our way before we got what we ordered) and there are still no chips on the menu (no caps - I’m happy with my daily carbs coming in bread form when I’m in France). Comfort does come into it, despite the crazy attention to detail. Sofas, that - I have it on good authority - took months and months to source, are just the right height with just the right slouch factor. Lazy day beds, meanwhile, have little nooks in just the right place to balance your glass of wine, and just the right chess board an arm’s stretch away. Oh, and I got some clarification on the doors. They're not supposed to be ugly - that got lost in translation - they're supposed to be opaque, to ensure you only get the full reveal of the view once they're open, and not a second before. See, I told you, design and attention to detail, and not a centimetre unaccounted for.